High-dose therapy (HDT) followed by autologous stem cell transplantation (ASCT) remains the standard of care for patients younger than 65 years of age with multiple myeloma (MM). However, this therapeutic approach has undergone substantial advances in this last decade, mainly due to the introduction of new drugs such as thalidomide, lenalidomide and bortezomib. These new drugs, in different combinations, have shown to significantly increase response rates after induction therapy and ASCT. Moreover, the positive results obtained with these agents in consolidation and maintenance strategies after ASCT strongly support the concept of continuous therapy, whose ultimate goal is the long-term control of the disease and the improvement of outcome. Preliminary data from studies investigating next generation proteasome inhibitors, such as carfilzomib and ixazomib, used upfront as well as at subsequent therapeutic lines, demonstrate the possibility of achieving molecular remission in most of the patients. The deeper responses obtained with new drugcombinations questioned the role of ASCT, and large, ongoing, phase 3 trials will shed light on the role and the timing of ASCT. Keywords: Stem cell transplantation, multiple myeloma, ASCT, proteasome inhibitors, carfilzomib, ixazomib. Keywords:Stem cell transplantation, multiple myeloma, ASCT, proteasome inhibitors, carfilzomib, ixazomib. Abstract:High-dose therapy (HDT) followed by autologous stem cell transplantation (ASCT) remains the standard of care for patients younger than 65 years of age with multiple myeloma (MM). However, this therapeutic approach has undergone substantial advances in this last decade, mainly due to the introduction of new drugs such as thalidomide, lenalidomide and bortezomib. 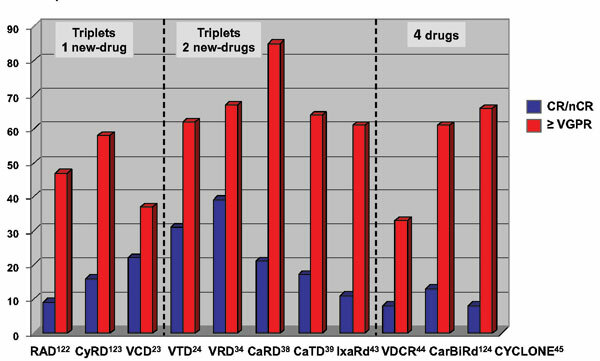 These new drugs, in different combinations, have shown to significantly increase response rates after induction therapy and ASCT. Moreover, the positive results obtained with these agents in consolidation and maintenance strategies after ASCT strongly support the concept of continuous therapy, whose ultimate goal is the long-term control of the disease and the improvement of outcome. Preliminary data from studies investigating next generation proteasome inhibitors, such as carfilzomib and ixazomib, used upfront as well as at subsequent therapeutic lines, demonstrate the possibility of achieving molecular remission in most of the patients. The deeper responses obtained with new drugcombinations questioned the role of ASCT, and large, ongoing, phase 3 trials will shed light on the role and the timing of ASCT.